4 Bedroom Detached House For Sale in Largs for Offers Over £330,000. This freshly decorated Detached Residence is set within Pencil View which is recognised as one of Largs most prestigious addresses on the preferred south side of town, close to the Yacht Haven and Golf Club. Offering stylish, family accommodation over two levels comprising: vestibule, reception hall, sitting room which connects to the dining room. Breakfasting kitchen with integrated oven, hob, hood, dishwasher and microwave all by 'Siemens' and central island/breakfast bar. Separate utility room off. The lower level also has bedroom four with French doors to the garden and adjacent shower room. 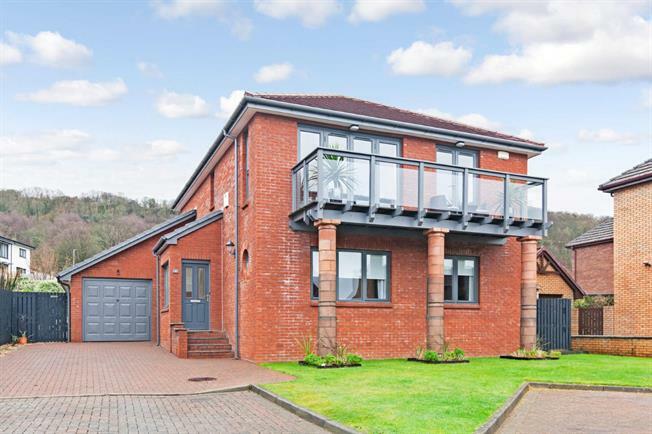 One of this home's most appealing features is the upstairs west facing lounge which opens out on to a large sun balcony and affords views across the Firth of Clyde. There are three fitted double bedrooms, with the master also connecting to the balcony. Fully tiled four piece family bathroom on this level. Gas central heating and double glazing. Driveway parking, attached garage which is floored and lined and utilised as a "man cave".